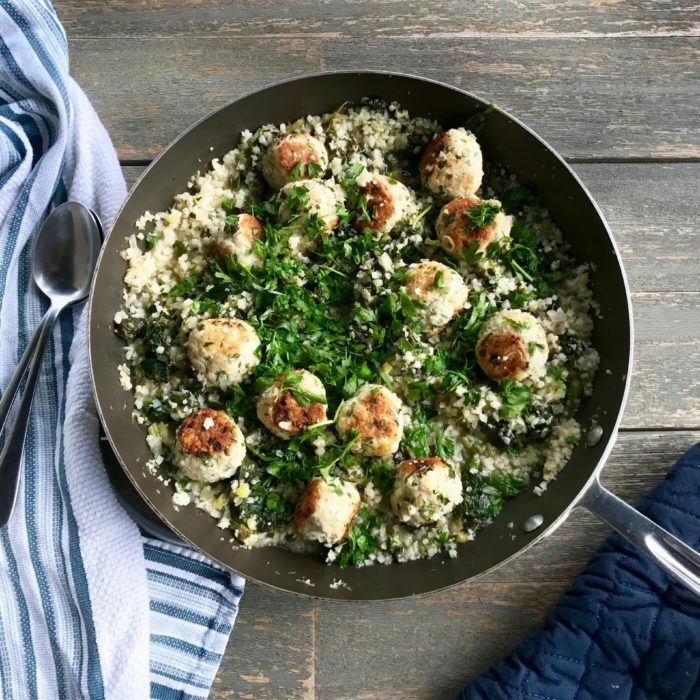 I have adapted this recipe from Elissa Goodman and love it because it takes no time, requires only 1 pot, and it tastes absolutely delicious! In a medium bowl mix together the turkey, bread crumbs, 1 tsp of the lemon zest, egg, garlic and fennel seeds. Then add in the white part of the green onions, 1/4 cup of the parsley, and some sea salt. Use an ice cream scooper to have even size meatballs, this should make about 15 meatballs. Heat a large skillet over medium-high heat, add in 2 tbsp of avocado oil. Add the meatballs to the hot skillet and brown on all sides until nearly cooked through, about 6 minutes. Remove the meatballs from the skillet and set aside, but leave the remaining oil/juices in the skillet. Add the onion, caulirice and spinach to the skillet and toss for a couple of minutes. Pour in the stock, rest of lemon zest and lemon juice and bring to a boil. Add the meatballs back in, simmer down covered for a couple of minutes. Sprinkle with the rest of parsley and the rest of the green onions.